If you are cleaning mold, mildew and need to disinfect spaces or objects, then you will need a backpack sprayer specifically designed for bleach solutions and fungicides. Wearing googles, rubble gloves and other safety equipment is also necessary. 2. How Do Bleach Backpack Sprayers Work? 3. What Can You Use a Bleach Sprayer For? 4. How are Bleach Backpack Sprayers Different than Weed, Herbicide and Insecticide Sprayers? Which Backpack Sprayer for Bleach Should You Choose? ** Below you will find more detailed reviews, but you can click the links in the table to see the latest prices and reviews on Amazon. Bleach is very harsh and will damage the components in the traditional backpack sprayer used for weeds and herbicides. In addition, the hose and nozzles need to be made out of special materials that won’t corrode from the bleach. Bleach will effect any seals and other rubber parts of a sprayer. The bleach sprayers are piston pump sprayers. The piston pump is in a sealed chamber which goes into the tank. The pump is never in direct contact with any of the chemicals since it is in the sealed chamber so it is protected from the harsh chemicals. When you push the handle, it moves the pump which creates pressure in the chamber which forces the liquid down through the hose and through the wand and out through the nozzle. When you are finished using the sprayer, make sure that you take the time to thoroughly rinse and clean out the tank, hose and wand to ensure that there is no bleach left inside. This will keep your sprayer in better working condition for years to come. A sprayer should never be left sitting over night without being cleaned out first. Eaves that were covered in mildew. Mildew on the clapboards/side of house. When using bleach, you will need a piston pump sprayer and not a diaphragm sprayer, as a piston pump has a sealed chamber that protects the unit from corrosion and damage from the harsh chemicals. In addition, special O-rings are used in these units (Viton seals) that will not break down (which will then cause leaking). Bleach is far more aggressive a chemical than herbicides and insecticides. Word of Caution: Never mix chlorine bleach with ammonia or chlorine bleach with fertilizers as it will produce a dangerous chlorine gas! 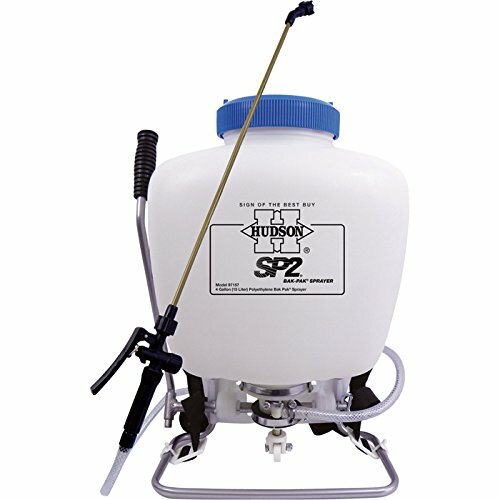 The top backpack sprayer models on the market all come with 4 gallon tanks. The smaller tank sizes are not available in the backpack style. When you take into consideration of the maximum PSI (pressure per square inch), remember that YOU are doing the pumping and when you stop pumping, the pressure eases off. So to keep the pressure up, you will need to keep pumping the sprayer. Another thing to remember – and I know this is obvious, but…. this is not a pressure washer. Traditional Backpack sprayers come in both battery operated and pump sprayers. With beach sprayers though, your choices are limited to only the pump sprayers. Choices for a backpack sprayer are limited to the 4 gallon translucent tank. These tanks (with harness and wand attached) usually weigh around 10 pounds, but when you and in your water and chemicals, they can become quite heavy. If this is your first time using a backpack sprayer, you may want to start out with using only 3 gallons until you get use to the weight. One think to look for in a backpack sprayer are good shoulder straps, back padding and an added lumbar strap. The lumbar strap helps keep the tank on you back without tilting or slipping around. NOTE: Sprayers are shipped with the hose connectors loose, in order to preserve the hoses. You need to tighten everything up. Don’t neglect this step or you will have chemicals dripping down your back! The Solo 425 is a high-grade, corrosion resistant plastic, and is designed to ensure no metal or rubber parts are made vulnerable to chemicals. It offers only 60 PSI which is the lowest of it’s competitors, but this unit has been around for a long time and is well known for it’s quality. It has a 4 gallon tank, piston pump, padded shoulder straps and if you are a lefty, you will love the fact that you can move the pump to the other side of the tank. What do customers say about the Solo 425? The value is good – it is not as expensive as it’s competitors and if you are okay with the lower psi, then it is a good buy. ==> Click here to read customer reviews and for pricing. The Hudson SP2 is the only one of their sprayers that you can use with chlorine. It has a 4 gallon tank with a piston pump. Offers an amazing 180 PSI, brass wand and steel pump. This unit is well designed and well equipped for getting the job done (although it does not have padded back support for added comfort). What do customers have to say? The reviews are very strong. Many love the design, it seldom clogs and works as described. Some comment that they wish it had the lumbar strap to help hold it in place better. The Smith NL401 sprayer has a special “no leak” design which guarantees that no liquids will leak and drip down your back while you are using the product. This is a well built sprayer that gives you 150 psi, a stream up to 30 feet and a stainless steel wand. It too has Viton seals to withstand the harsh chemicals. Strong stainless steel frame and a unique pump design – this sprayer is designed to last. This unit has padded shoulder pads and PADDED BACK SUPPORT as well as a lumbar strap to help hold the unit in place. If you are going to do any amount of spraying you will really, really appreciate these features. Customer reviews for this sprayer have been few – though I was pleased to see that when I customer had a problem with the shoulder straps that the manufacturer reached out and offered and immediate replacement. 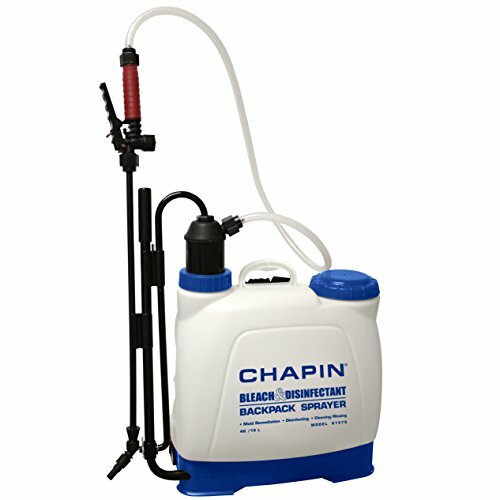 The Chapin 61575 is a popular piston pump, 4 gallon bleach backpack sprayer. It has a 4 inch wide opening, padded shoulder straps and pressure of 100 PSI. Reviews for this bleach backpack sprayer have been very good. Customers have commented that it provides a great stream of about 25 feet, great for cleaning the outside of the home, etc. No issues with the design of the product. What challenges have people had with the Chapin 61575? A few people have had difficulty with the assembly – not sure why, but they have. Many have commented that they would have the straps and harness to include padding for the back to make it a bit more comfortable while working. ==> You can read complete reviews of the Chapin 61575 here. It all comes down to quality and budget. 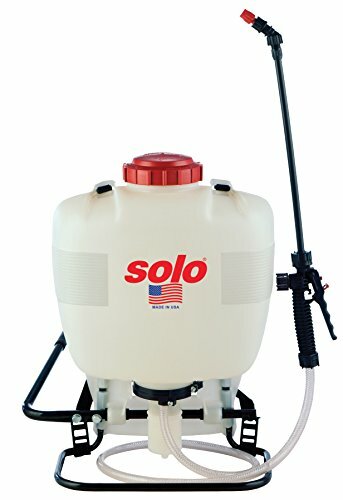 If you are on a tight budget and are okay with a lower PSI, then the Solo 425 would be the entry level backpack sprayer for bleach to use. 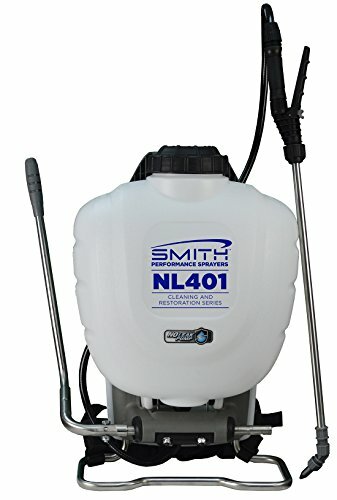 If you can afford to step it up just a bit, then I would select the Smith NL 401 Backpack Sprayer. The Smith is newer on the market, has newer technology, uses high grade components and is designed to last. It also offers back and lumbar support for better comfort and holds the tank on the back better than the other models. Remember: Always use bleach in a well ventilated area.